Soundbars and surround systems for your home theater vary in price anywhere from $100 to many thousands. Finding a balance of price and performance where you get the most for your money is what many are trying to do. For some, that sweet spot is in the $500 range but for many, that happens in the $1000 range. If you belong to the latter group, you’re in the right place. 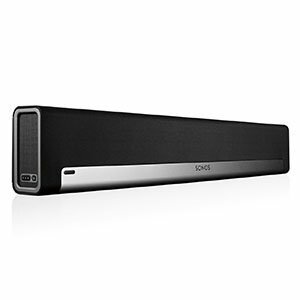 We have put together a selection of best soundbar speakers you can grab for less than a grand at the moment. Let’s check these out and see what they offer. 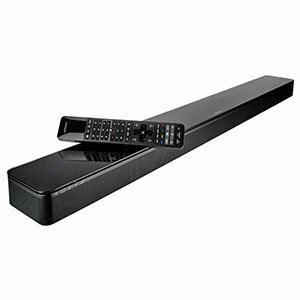 Samsung’s J series of soundbars were specifically designed to compliment their curved TVs. However, it wasn’t long before word got out and everyone realized just how good these speakers are. While J6500 might be among the cheapest ones, it will get you the taste of what J series is all about at a reasonable price. If we could fault anything about Samsung’s offering with the HW-J6500 model, it would have to be the simplicity of what is actually included within it. 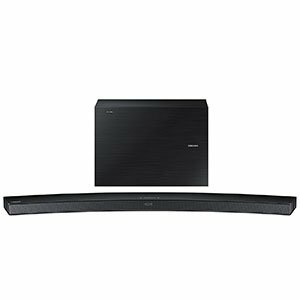 Many devices at this price range feature multiple satellite peripherals in order to create a more immersive listening experience, but the Samsung only features a subwoofer alongside the soundbar itself. They both perform well, of course, but it’s something worth considering. LGs SJ9 comes might look simple, however, it is anything but. They have packed it chock full of features that improve the performance but also do wonders for user’s convenience. The only real thing it is missing is a pair of satellites. With that said, we are more than ready to turn a blind eye to that. At this price point, we tend to see packages that include a whole lot of peripherals which are lacking in LG’s offering with the SJ9, but there are serious arguments that an over reliance on quantity rather than quality is at work in many of these cases. As such, we are happy with the sheer quality that LG has packed into this model. An unassuming but distinctive design. Plenty of useful extras that work well with in-home setup. If you are in the market for a soundbar and money is no object, the Playbar is definitely towards the very top of the list in terms of quality, integration with other devices, and overall performance. Whilst expensive, the smorgasbord of extra features and clever design elements make this an easy product to recommend. It cannot be overstated that this is a high-end device with the price tag to match. Whilst it does manage to deliver pretty fantastic audio quality and a great overall listening experience which is enhanced by a number of additional extras, you should be mindful that if you can live without these extra perks you can find pretty similar sound quality for a lot less money. Lacks depth in the low end. 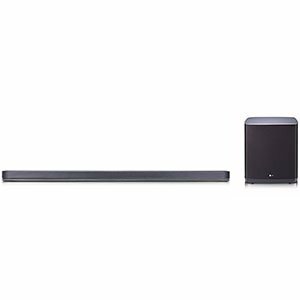 Panasonic SCHTB70 is a very compact but powerful soundbar that combines performance with a low profile. What really makes it stand out from other similar designs is adaptive audio. This feature allows the soundbar to change the orientation of the output so that you always get perfect performance, no matter how the bar is oriented. Overall, great home unit. 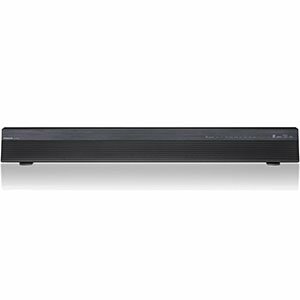 ​It is a fairly standard complaint amongst soundbars that they fail to deliver much in the way of a bass presence, and the SCHTB70 is, sadly, no exception to this rule of thumb. It is most notable during the playback of particularly bass heavy music, but may also be heard (or rather not heard) in action sequences which, ironically, lack a little punch. A visual design that puts most other devices to shame. Fantastic audio performance on both music and movies. Works well alone, but even better with additional devices. A little lacking in additional features. Bose has managed to pull off quite a feat with the SoundTouch 300. A simple, truly gorgeous device that manages to almost make you forget that you’re listening to a soundbar rather than a full home stereo set-up. Whilst it could do with a few more features to compete at the price point, the sound quality makes up for this. Despite being a top of the range device from Bose, the SoundTouch 300 is a little light on extras which, for us, would cement it as a firm favourite in this price category. Competing models pack on the features to justify the high price tag, but Bose has chosen not to deliver above the basics. It does those basics very, very well, but not a whole lot else. A lot of bang for your buck with 3 extra speakers. Plenty of customization options allowing a fine-tuned experience. Not the most visually exciting design, looks a little dated. Whilst undeniably powerful, the sound lacks nuance. Nakamich’s Shockwafe is a great product, but it isn’t for everyone. And that’s okay. If you’re in the market for power, punch, and a listening experience that will fill out the entire room, then this is a perfect option. If you prefer a more detailed, accurate, and nuanced listening experience, you may want to look elsewhere. If the visual design of a device which you will be sharing your living room with is something of a concern to you, then the Shockwafe may be worth taking an in person look at before you choose to buy. It is an odd design, and the soundbar itself and its various peripherals look a little dated over all. This, of course, is not a deal breaker for many, but should be considered in advance. Are $1000 Soundbars Really Worth It? Trying to put a price limit on audio gear is never really a forgiving thing to do. Especially if you are one of those who rarely accept compromises. With that said, asking this question is perfectly reasonable. The main worry here is whether or not you can even get audiophile grade audio performance from a soundbar. After all, the whole point of these devices is to be a more sleek alternative to bulky speaker cabinets. The truth is that audio quality is not always the only metric, especially when you are dealing with high end models. Even some of the best soundbars on the market will feature smaller drivers, but it is all about how those drivers are used. With that said, $1000 will buy you plenty of speakers. Another thing to consider is the quality of both materials and components that go into soundbars from this price range. All of that has an impact on the performance, durability as well as aesthetics of these units. When it comes to built in features, you will start to see much more HDMI support and advanced audio management. However these are present in cheaper soundbars as well, just not this frequently. What most high end soundbars offer is convenience. What we mean by this are Multi Room controls, native support for all kinds of services and more. At a certain point, any additional dollar you invest into a soundbar doesn’t get you so many performance upgrades or hardware upgrades. What you do get most often are convenience and feature upgrades. Figuring out whether or not this is worth the extra cost is something every user has to do for themselves. With that said, it also comes down to brands. Some brands will focus more on pure, raw performance, while others will push an inherently weaker system to an acceptable level using digital audio management solutions. Once you reach the $1000 price range, there are more variables to think about than you will see in cheaper soundbars. Deciding to go with a $1000 soundbar is a great way to complete your home theater setup. We have shown you some of the best models in this price range, including one compact unit that is aimed at those who value a clean look. Each of these brings its own set of features, performance profiles and aesthetic solutions. However, they all deliver audio quality that puts them in a category of their own. 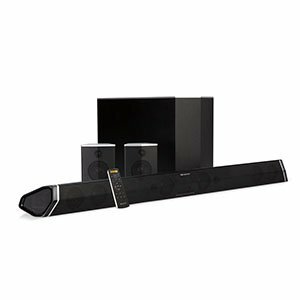 Whether you want a solid solution for your home theater, or a single speaker setup for all your audio needs, these soundbars will work more than well.